As you might expect with a gun giveaway, some restrictions apply, so be sure to read the rules below before entering. Your Mountain (with the help of Gunwerks, Vortex Optics, Federal Premium Ammunition, Viking Tactics, Proof Research, Timney Triggers, Wyoming Arms and Magpul) is giving away the ingredients to fine tune your own custom, do it all hunting rig with a retail value of about $3,237.00. As you might expect with a gun type sweepstakes, the restrictions listed below apply so read all the way to the bottom. To enter, share your email address, and then read the rules below for additional ways to enter. Keep up to speed on the give away by following us or liking Your Mountain on your social media of choice, and subscribe to the Your Mountain Podcast (available on iTunes, Stitcher, and everywhere else you find great podcasts). Alternatively, your may send Your Mountain a postcard with your contact information to the address listed below in the Rules of Promotion. Your submission will enter you into a random drawing to win the hunting rifle package listed below, and you will receive a newsletter from us - with information on how you can get more free swag. So drop us your email then follow/like and listen to hear more. Your information will also be shared with Gunwerks, Vortex Optics, Federal Premium Ammunition, Viking Tactics, Proof Research, Timney Triggers and Magpul to receive their offerings. Enter by the deadline on May 2nd. We'll be announcing the winner on or about May 15th. Coupon(s) for four (4) boxes (80 rounds) of Federal Premium ammunition in your caliber of choice retail valued at up to $364.00 (must be available for retail purchase) (https://www.federalpremium.com/products/rifle/premium-centerfire-rifle). NO PURCHASE OF ANY KIND NECESSARY TO ENTER OR WIN. OFFERED ONLY TO LEGAL U.S. RESIDENTS AGED 18 YEARS OR OLDER, WHO ARE ELIGIBLE TO OWN A RIFLE. ELIGIBILITY: Open to U.S. residents aged 18 years or older at the time of entry, who are eligible to own a rifle. Only individuals may enter. Employees of Your Mountain and Gunwerks, Vortex Optics, Federal Premium Ammunition, Viking Tactics, Proof Research, Timney Triggers and Magpul, and their immediate family members (spouses and siblings, children and parents and their spouses) or members of the same household (related or not) are not eligible. Void where prohibited. Mail a postcard with your name and contact information to Your Mountain Podcast, PO Box 20736, Cheyenne, WY 82003. Entry submitting a valid email address through the website, or submitting a postcard with the required information is mandatory before you are eligible for any of the additional entries described in paragraphs 2-5 below. 2. Podcast review. Review the "Your Mountain" Podcast on iTunes, or any other platform you use to subscribe to podcasts. Then, send an email to Your Mountain. Include in the body of the email a copy of the review you submitted. Emails should be sent to yourmountain@itsyourmountain.com. Include "Gun Giveaway-Podcast Review" in the subject line. You will receive a maximum of one additional entry into the Gun Giveaway regardless of how many reviews you write and submit on different platforms. 3. Share us on Social Media. Share one of Your Mountain's Gun Giveaway posts on Facebook, Twitter, or Instagram. Then send us an email with "Gun Giveaway-Shared" in the subject line. Make sure what you share is can be viewed publicly, and include your social media handle in the body of the email so we can verify that you shared the Gun Giveaway post. You will receive a maximum of one additional entry in the Gun Giveaway for sharing or retweeting a post. Sharing or retweeting additional posts will not result in additional entries. 4. Follow Your Mountain on Instagram, Facebook, and/or Twitter. Then send Your Mountain an email with "Gun Giveaway-followed on (insert social media platform here)" in the subject line. In the body of the email, include your social media handle so we can verify you followed Your Mountain. Emails should be sent to yourmountain@itsyourmountain.com. You are only eligible to receive a maximum of one additional Gun Giveaway entry whether you follow Your Mountain on one or more social media platforms. You will not receive an entry per additional follow. 5. Refer a Friend. Convince a friend to enter the Gun Giveaway through the Your Mountain website. Once they enter, have them send Your Mountain an email at yourmountain@itsyourmountain.com. In the subject line have them write "Gun Giveaway-Refer a Friend." In the body of the email have them explain they entered the Gun Giveaway because you referred them. They must provide your name and the email you used to enter through the Your Mountain website in the body of the email. This will entitle you to one additional entry in the Gun Giveaway. You can receive a maximum of one additional Gun Giveaway drawing entry for referring a friend. You will not receive additional entries for each additional friend that you refer to the Gun Giveaway. PROMOTION PERIOD: The Gun Giveaway begins at 12:00 AM Mountain Time on April 2, 2019, and ends at 12:00 AM Mountain Time on May 2, 2019. All entries must be received during the Promotion Period and meet other requirements in these Official Rules to be eligible to win a prize. Contact information must have been submitted accurately to qualify. Limit one entry per person, per category. Automated or multiple entries per category are prohibited. Individuals who attempt to increase odds through fake emails, fraudulent activity, or other means will be disqualified. DETERMINATION OF WINNER: On or about May 5, 2019, an independent committee ineligible to receive the prize will conduct a random drawing from among all entries, whether received electronically or by mail, to award the Gun Giveaway package. Promotional graphics, including graphics and information contained in weblinks, do not necessarily represent the actual prize. Four (4) boxes (80 rounds) of Federal Premium ammunition in your caliber of choice (must be available for retail purchase). HOW TO COLLECT PRIZE: Your Mountain will put the winner in contact with Gunwerks, Vortex Optics, Federal Premium Ammunition, Viking Tactics, Proof Research, Timney Triggers and Magpul to make arrangements for collecting the prize components. Your Mountain does not possess the individual prize components and will not serve as an intermediary. It is up to the winner to work with Gunwerks, Vortex Optics, Federal Premium Ammunition, Viking Tactics, Proof Research, Timney Triggers and Magpul to make arrangements agreeable to the companies to collect the prize components. TRANSFER OF FIREARM: Transfer shall be conducted through a Federal Firearms Licensed (FFL) dealer selected by the company requiring such transfer, after consultation with the winner. All transfers will be conducted in strict compliance with all applicable federal, state and local laws. By entering this sweepstakes you represent that you are not legally prohibited from owning or taking possession of firearms, ammunition or any components of a firearm. Entrants and winner are responsible for knowing their state gun laws including age and residency requirements and must be able to pass a background check to receive the prize. If the transfer of any portion of the prize to you as winner is legally prohibited for any reason, another winner will be selected by the independent committee through a random drawing. GENERAL: Taxes on prize and all expenses related to acceptance and use of prize and not specified are the sole responsibility of winner. Winner of prize valued at $600 or more will be issued an IRS 1099 Form for the value of the prize. Odds of winning will be based on the number of eligible entries received. No cash redemption permitted. No prize substitution, in whole or in part, except by Your Mountain and/or Gunwerks, Vortex Optics, Federal Premium Ammunition, Viking Tactics, Proof Research, Timney Triggers and Magpul, due to prize unavailability, safety or security considerations, or any other reason as solely determined by Your Mountain and/or Gunwerks, Vortex Optics, Federal Premium Ammunition, Viking Tactics, Proof Research, Timney Triggers and Magpul, in which case a prize of comparable or greater value will be awarded. By participating, entrants agree [a] to these rules and the decisions of Your Mountain and/or Gunwerks, Vortex Optics, Federal Premium Ammunition, Viking Tactics, Proof Research, Timney Triggers and Magpul, which shall be final in all respects relating to this Gun Giveaway; and [b] to release, discharge and hold harmless Your Mountain and Gunwerks, Vortex Optics, Federal Premium Ammunition, Viking Tactics, Proof Research, Timney Triggers and Magpul, and their agents from any and all injuries, liability, losses and damages of any kind resulting from their participating in the Gun Giveaway or their acceptance, use or misuse of a prize including, without limitation, personal injury, death and property damage; and if a winner, [c] to permit Your Mountain and Gunwerks, Vortex Optics, Federal Premium Ammunition, Viking Tactics, Proof Research, Timney Triggers and Magpul, to use his or her name, photograph, likeness, statements, and city and state for advertising, publicity and promotional purposes in all media, including but not limited to on air and online, in perpetuity, without compensation and agree to execute a document showing consent to such use upon request (unless prohibited by law). In order to receive a prize, at the discretion of Your Mountain and/or Gunwerks, Vortex Optics, Federal Premium Ammunition, Viking Tactics, Proof Research, Timney Triggers and Magpul, potential winner may be required to complete an Affidavit of Eligibility & Release of Liability which must be signed & returned (along with any other documentation reasonably required for prize fulfillment, such as, but not limited to providing proof of identity and various licenses or permits). Your Mountain and Gunwerks, Vortex Optics, Federal Premium Ammunition, Viking Tactics, Proof Research, Timney Triggers and Magpul are not responsible for and shall not be liable for: [a] electronic, hardware or software program, network, Internet, computer or other technical malfunctions, failures, or difficulties of any kind, including without limitation, server malfunction or by any human error which may occur in the collection, processing and transmission of data; [b] lost, late, misdirected, illegible or incomplete entries or postage-due mail; [c] any type of graphical or other error in the advertising or printing of the Gun Giveaway or in the administration of the Gun Giveaway; or [d] any condition that may cause the administration, security or proper play of the Gun Giveaway to be disrupted or corrupted; and in such event Your Mountain and/or Gunwerks, Vortex Optics, Federal Premium Ammunition, Viking Tactics, Proof Research, Timney Triggers and Magpul reserve the right in their sole discretion to cancel or suspend the Gun Giveaway or any portion thereof and to award the prize via a random drawing from among all eligible entries legitimately received prior to cancellation. Entry information becomes property jointly and severally of Your Mountain and/or Gunwerks, Vortex Optics, Federal Premium Ammunition, Viking Tactics, Proof Research, Timney Triggers and Magpul. Internet entry must be made at the authorized Web site address. In the event of a dispute regarding the identity of the person submitting an online entry, the entry will be deemed to be submitted by the person in whom the e-mail account is registered at the time of entry. Potential winner may be required to provide evidence that winner is the authorized account holder of the e-mail address associated with the winning entry. Your Mountain and/or Gunwerks, Vortex Optics, Federal Premium Ammunition, Viking Tactics, Proof Research, Timney Triggers and Magpul’s decisions are final and binding. In the event that Your Mountain and/or Gunwerks, Vortex Optics, Federal Premium Ammunition, Viking Tactics, Proof Research, Timney Triggers and Magpul are not able to contact the randomly-chosen winner after due diligence (two emails and one telephone call, if telephone number provided, or via mail for postcard entries) and a time period of 7 days from the date of the drawing, the independent committee may draw a new winner and the first winner forfeits all claims to the prize and/or damages and holds blameless Your Mountain and Gunwerks, Vortex Optics, Federal Premium Ammunition, Viking Tactics, Proof Research, Timney Triggers and Magpul. It is the responsibility of entrants to provide valid contact information so Your Mountain and Gunwerks, Vortex Optics, Federal Premium Ammunition, Viking Tactics, Proof Research, Timney Triggers and Magpul can make contact. 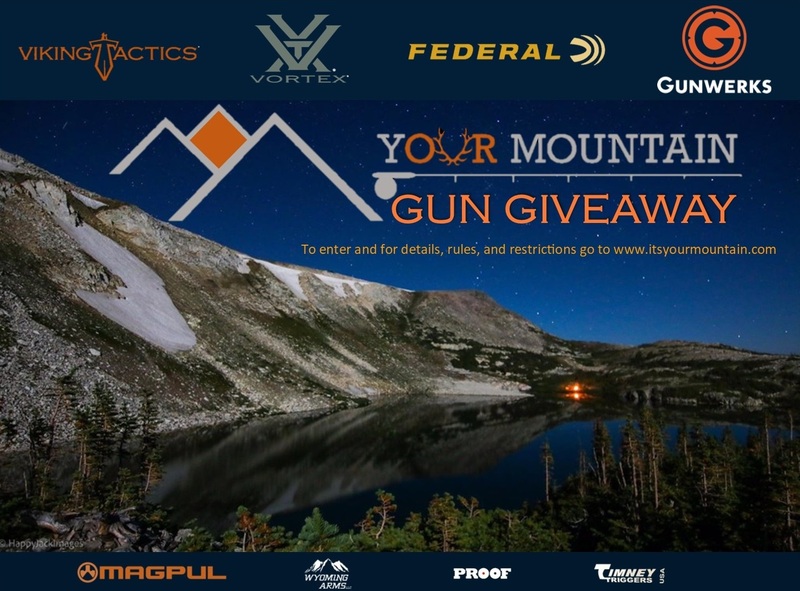 Entering this Gun Giveaway indicates that you consent to receiving periodic ordinary mail and email from Your Mountain and/or Gunwerks, Vortex Optics, Federal Premium Ammunition, Viking Tactics, Proof Research, Timney Triggers and Magpul. Further, Your Mountain and/or Gunwerks, Vortex Optics, Federal Premium Ammunition, Viking Tactics, Proof Research, Timney Triggers and Magpul’s promotional partners and other parties grant Your Mountain and/or Gunwerks, Vortex Optics, Federal Premium Ammunition, Viking Tactics, Proof Research, Timney Triggers and Magpul, its promotional partners and other third parties with whom Your Mountain and Gunwerks, Vortex Optics, Federal Premium Ammunition, Viking Tactics, Proof Research, Timney Triggers and Magpul chooses to share entrants information, permission to contact entrants about upcoming promotions, special offers or for other reasons via electronic and ordinary mail. WINNER LIST: To receive the name of the winner, mail a self-addressed, stamped envelope to: Your Mountain Podcast, PO Box 20736, Cheyenne, WY 82003. SPONSOR: Your Mountain Podcast, PO Box 20736, Cheyenne, WY 82003.